Perhaps, after reading my comment on the new products of the three multinationals, someone thought that I was exaggerating or that I misinterpreted the situation. After all, it could also be said that Krušovice 10 is another attempt in Heineken's struggle to restore the image of that brand. That Master Zlatý just wants to complete the colour palette (together with Polotmavý 13 and Tmavý 18) of a brand that has been already three years on the market and that it was about time it was made available in bottles, especially now when sales bottled beer has for the first time ever in the Czech Rep. surpassed sales of draught beer. And that Staropramen 11 is just Smíchov's response to Pardal Echt and Gambrinus Excelent. And since we are talking about the jedenáctká from Gambrinus. The word on the street is that the goal of this beer was to revitalise the most popular brand in this country, which, it seems, has been slowly loosing some of the public's favour. I've got no clue about the scale in which this is happening, but I've come across quite a few people who've said they don't like Gambrinus anymore. And I'm not speaking about "beer geeks" here, in some cases they were people who still think Pilsner Urquell is the best beer in the world. The reason, according to them, is the loss of quality. Anyway, the truth is that Excelent was launched with a heavy advertising and marketing campaign. It's been already two years of that, though (I think) and it could be that that initial drive has lost some of its momentum, which may have forced the suits at Prazdroj to find another way to bring some new life to their best selling asset. Nefiltrovaný Gambáč! I had to try that! There weren't many people when I came in. I took a seat at the bar and told the Výčepní to pour me a nefiltrovaný. The bloke put it in front of me and said something like "Nice, eh?" (speaking about the beer, of course). Identical to pretty much every other unfiltered pale lager, it looks. The nose is also similar to many, grass, herbs and a touch of fresh white bread. The taste. Hmmm... Not bad, not bad at all, really. On the other hand, not only I was really thirsty, but that also happened to be my first beer of the day, and you know what effect that tends to have, so I ordered another one (about 45 seconds later, I was really thirsty). Unlike the Gambáč we are all familiar with, the nefiltrované (point to Prazdroj for not calling it Kvasnicové) does have some flavour and character, the problem is that it's too "green". I don't know how long Gambrinus lagers (a couple of days shy of not enough, I would bet), but this beer could have used a couple more weeks in a cold cellar. Have you ever eaten a banana that was not fully ripe yet? Well, pale lagers that have not lagered enough usually leave me with a sensation that reminds me of that. In short, once I started paying attention to it I stopped liking it so much. But that's my thing. Still this product made me muse a bit: Who is its target consumer? I don't think it's the people who have stopped drinking Gambrinus and now prefer regional or even micro beers. They won't be that easily drawn to the unfiltered version of a beer they don't like anymore. 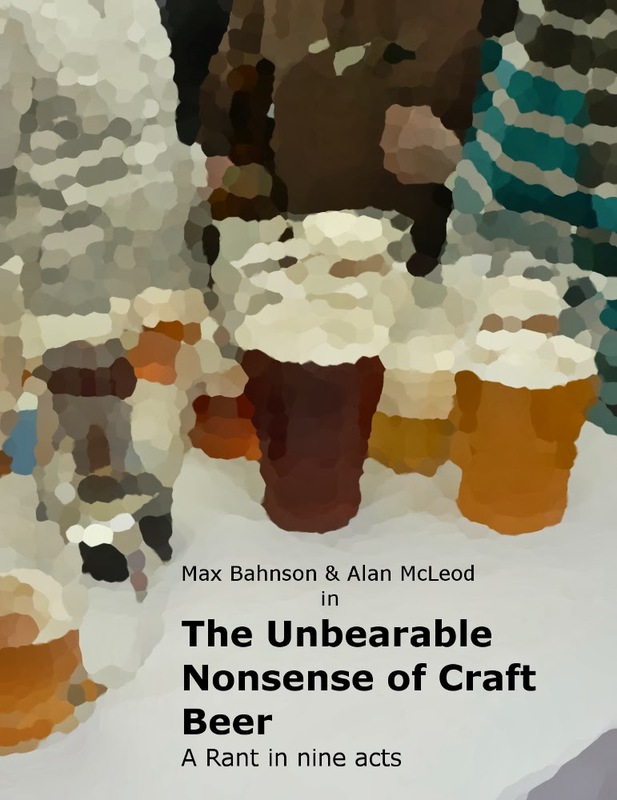 Yes, there might be some that, like me, will try it out of curiosity, but I don't see them being very impressed by it (not to mention that for that, they will have to happen to be at a pub that has the beer in the first place). And the usual Gambáč drinker? 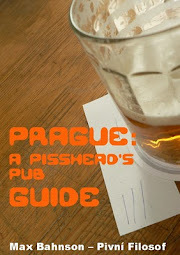 I would say that in most cases it is somone that comes to their pub, orders a "pivo" without much pondering on the subject anymore. Perhaps some will order the unfiltered version, also out of curiosity, but likely is that after one glass they will go back to the stuff they are used to and like. So, who is this product's target consumer? I don't know and somehow I have the impression the people in Pilsen don't know it very well, either. 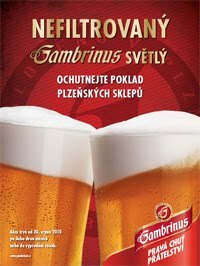 Gambrinus Nefiltrované seems to be a pilot test, the poster at U Waldeska said the beer will be available only until the end of October. Besides, I don't remember having seen anything in the media about it or posters at other pubs (which doesn't necessarily means that there hasn't been advertising, I've been so busy lately that it could have flown under my radar). While I was having my second glass, I asked the Výčepní how this beer was selling. Not well, it had been available for a week and only two 50l kegs had been sold so far. Perhaps the fault is the waiters', I didn't hear any of them offer the new beer or perhaps is the marketing. I should check what's going on with it at other pubs. Whatever it is, it makes you think when the, by far, best selling brand in this country decides to respond to the change in habits of a certain group of consumers, most of whom don't buy the brand anymore. I wonder if Master will make it over here in bottles? Wouldn't mind trying it again. Had it at the Plzen fest a few weeks ago, and much like the unfiltered Plzen, it was bloody awful i must say. Thankk god for the Master 18, still a fine drink. Interesting article on Plzen's ongoing battle against the rising regionals - http://ekonomika.ihned.cz/c1-46639310-ach-ta-podoba-prazdroj-a-k-brewery-se-prou-o-pivo-prima . It notes that K brewery's beers are mostly pushing out gambrinus from pubs and also gives an interesting insight into why they're so pissed - because their own employees are making the switch to K.
Thanks a lot for the link. Very interesting article and reflects a lot what I've seen on the streets recently.